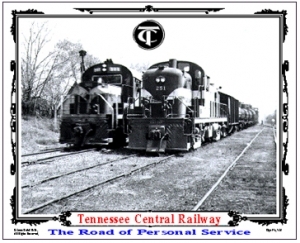 The Tennessee Central Railway operated between Harriman, TN in the east, to Hopkinsville, KY in the west, with its hub and general offices in Nashville. 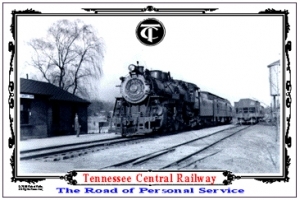 A ride on the TC Museums excursion train is an amazing experience through the hills and valleys of Middle and East Tennessee. During World War II, the TC moved war materials and troops in and out of Ft. Campbell Military Base that straddled the Tennessee and Kentucky border, and is still a major fort today. Heritage T-shirt featuring the beautiful steam No. 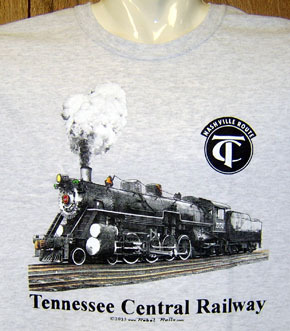 551 owned by the Tennessee Central Railway,.. design so authentic you just might feel the heat and smell the smoke. 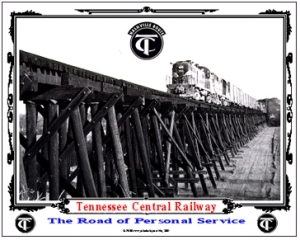 Tennessee Central Railway was The Road of Personal Service. Tennessee Central Rwy coffee mug featuring the beautiful 4-8-2 steam locomotive No. 551. She was built by the American Locomotive Co. in 1926 with 63 inch drivers, weighing in at 441800 lbs. 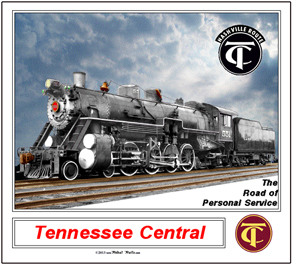 Colorful Tennessee Central mouse pad featuring the beautiful ALCO built 4-8-2 steam locomotive No. 551. Built by the American Locomotive Co. in 1926 with 63 inch drivers, weighing in at 441,800 lbs. 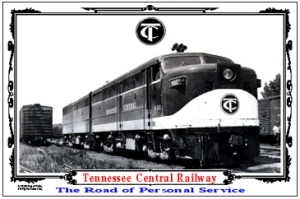 6 inch x 6 inch square tin logo sign of the Tennessee Central Railways Nashville Route Logo. 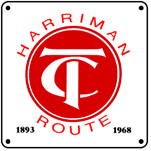 6 inch x 6 inch square tin logo sign of a Tennessee Central Railroad Co. logo used around 1905 before it built tracks into Nashville, thus the Harriman Route, later to become the Nashville Route. Tennessee Central Railway freight ALCOs No 801 and 801B are waiting for their train at the Nashville Yards circa 1962. 801 had been repainted in black and white livery. Two or three other 800's were repainted each with slightly different nose. As delivered ALCO FA1 803 on bridge near Ft Campbell Military Base. TC took delivery of new diesels in KY due to lower tax rate. All FAs were in maroon & yellow scheme, most later repainted in black/white. Note rarely seen lettering on bridge. 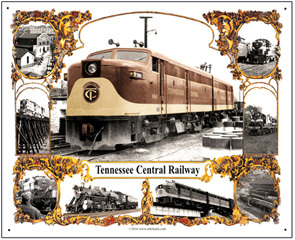 Beautiful and unique 10x12 metal sign with images of the Tennessee Central Railway diesel, steam and facilities over its years of operation, up through 1968. 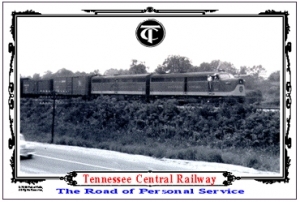 Unique tin sign of Tennessee Central Railway over the road freight train running along Highway 70 in East Tennessee, lead by ALCO FAs 801 and 801B. 801B was the only B-unit the TC owned, along with 5 A-units. Tennessee Central Railway steam powered passenger train pulling into Emory Gap Station in East Tennessee. A very nostalgic scene of days gone by. 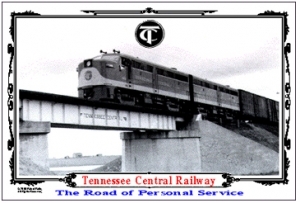 Tennessee Central freight passing at the Jefferson Street signal station heading to Hoptown just before crossing the Cumberland River in Bordeaux, TN on its rotating bridge manned by the Paty family. A house was provided for the family by the TC. 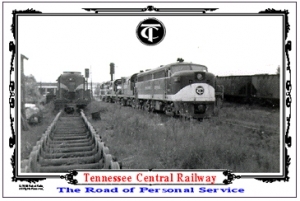 Unique tin sign of Tennessee Central Railways Nashville Freight yards ready track loaded with ALCO RS diesels and ALCO FA1 No 801 at the front. View is looking toward Nashville in the background. Nostalgic scene of ALCO RS3 diesel No. 255 pulling into the Crossville Station in East Tennessee with passengers waiting to board. Hopkinsville bound road freight crossing long wood trestle just east of the TCs Jordonia Station and west of Bordeaux TN. Ashland City Hwy is to the left. Train was a daily between Nashville and Hoptown and Fort Campbell. 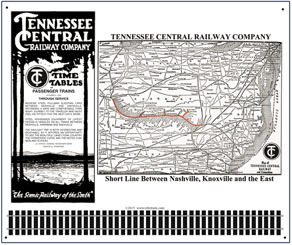 Reproduction of a 1941 system map of the Tennessee Central Railway, along with an older time table. 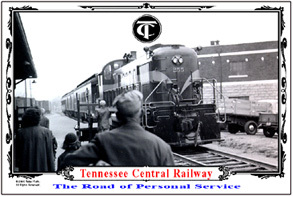 Very interesting to see all the cities and towns served by the TCRY, the road of personal service. 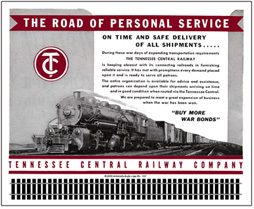 Unique tin sign of an advertisement issued by the Tennessee Central Railway Co. in May of 1944 promoting its safe on time deliveries. TC was a big mover of war materials and troops in and out of Ft Campbell Military Base.